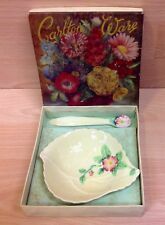 Carlton Ware, Australian Design, Foxglove Plate and Spoon in Original Box. Handpainted with embossed mark reading 1875 on base. In very good condition. Original box has some cellotape marks and discolouration. Dispatched with Royal Mail 2nd Class. Base has full Carlton Ware Australian Design Stamp plus Impressed number--1753. Carlton Ware "Buttercup" Pattern Crescent Dish & Pin Dish. Carlton Ware "Buttercup" pattern, crescent shape dish and round pin dish. Majolica leaf design yellow body, with green trim. Dates to circa 1930's. Stunning Bright Yellow Salad Bowl Decorated in Carlton Ware’s Orange Fruit Pattern in very good condition. 23cms wide and 12cms tall. New listingCarlton Ware Boxed Individual Butter Dish & Ceramic Spreader. Majolica leaf design yellow body, pink flower, with green foliage, also on handle. Presented in original Carlton Ware box. Dates to circa 1930's. THEY ARE IN VERY GOOD CONDITION AND HAVE MAKERS MARKS ON THE REAR. The cheese dish is in very good condition, the only flaw I can see is the slight crazing to the base and a faint scratch to the side of the wedge. Carlton Ware. Cheese Dish & Honey Pot. The decorators would initial their work and this one has an initial in both brown and the matt black A red bean on top of a bee-hive with large raised bee details. Made by local manufacturers here in Stoke-on-Trent, made in England with a an attractive leaf and tomato design impressed into the ware. A 3 section leaf type moulded design dish with tomato design. A leaf type moulded design dish and a lidded sugar bowl or jam pot. In good condition; previously used the glaze is shiny, the pattern is bright. The dish is approx 14 cm long and approx 13 cm wide.Impressed into the underside is the number 1670. Stunning Bright Yellow Bowl Decorated in Carlton Wares Fruit Basket Pattern.This is one of Carlton Wares Very Early Embossed Range from The Early 1930,s. Base has early Carlton Ware Backstamp plus printed Number--777360. A lovely genuine Carlton Pear tea/coffee pot in superb condition. Two Gorgeous Carlton Ware anemone bowls. Beautifully hand painted anemone design orange and mauve embossed flowers on a yellow body. They are signed Carlton Ware and stamped MADE IN ENGLAND Australian design No. 10804 & 786475 ( smaller dish numbers smudged) with the impressed shape numbers 933 & 928. Two gorgeous rare colorway Carlton Ware buttercup plates. The bottom is signed Carlton Ware and stamped MADE IN ENGLAND Australian design with the impressed shape number 2257/6. These Carlton plates are also unusual in that they stand on three little feet. On the width side of the dish there are several dark marks within the glazing. Lid as per photo with green handle. Sold on behalf of Oxfam Wokingham. Carlton Ware back stamped. Model Shape 2477. A genuine & original piece of advertising ware produced for British Leyland. In excellent condition. RETRO CARLTON WARE BRIGHT YELLOW LEAF SHAPED BOWL / DISH WITH A RED CURRENT PATTERN. Attractive Carlton Ware Dish with raised cherry decoration. There is also an impressed number possibly 2109 ?. Carlton Ware Vintage Car " Bullnose Morris " British Leyland Advertising. Bullnose Morris in Yellow. A genuine & original piece of advertising ware produced for British Leyland. Carlton Ware back stamped. Model Shape 2477. Marks under the wheels are a discolouration of the original glue used to attach the car to the base. Buy It Now on this large triangular serving dish in the Mimosa pattern by Carlton Ware. Pattern depicts the lovely yellow Mimosa flowers against a cream background and with a dark brown trim. Perfect for serving bread, salad, cakes etc. CARLTON WARE SERVING DISH or BOWL CROCUS pattern having Yellow colourway and Embossed Red/Purple/Yellow Crocus with Green Leaves --Has Small Handle to Side. Base has Carlton Ware stamp plus Impressed Number---1747/2. Vintage Carlton Ware Hydrangea design floral embossed double serving/snack dish. Base has Carlton Ware stamp Plus Impressed Number--933. Carlton Ware "Buttercup" Pattern 4 x Dishes. Carlton Ware "Buttercup" pattern, set of four dishes. Majolica leaf design yellow body, buttercup handle on side, with green trim. Dates to circa 1930's. VINTAGE CARLTON WARE AUSTRALIAN DESIGN LARGE SHAPED BOWL, MAGNOLIA PATTERN. I have for sale a very beautiful CARLTON WARE AUSTRALIAN DESIGN OVAL SHAPED BOWL, MAGNOLIA PATTERN. The size of the dish is large and its 27 cm long by 21 cm wide and 7 cm high, The base is stamped Carlton Ware. Slight ware at the base, pictured. It is decorated with a lovely 'fruit collar', this is made up of all different types of fruit. CARLTON COMMEMORATIVE WALKING WARE CUP QUEENS SILVER JUBILEE YELLOW SIGNED MARK. Dispatched with Royal Mail 2nd Class. Good Condition apart from a chip on the rim, see pic 5. Unboxed green cabbage leaf shaped dish. Carlton Ware. 24cms at widest point. Gorgeous Carlton Ware buttercup bowl. The bottom is signed Carlton Ware and stamped MADE IN ENGLAND Australian design with the impressed shape number 1483. These flower shaped dish is decorated with yellow embossed petals with green and orange centre. Carlton Ware Pottery Leaf Dish, in Autumn colours of brown, yellow/hint of green.Marked on base in black -Carlton Ware- England. Embossed number 2367/8. Size approx. 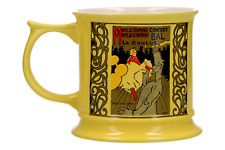 THIS LOVELY CUP HAS THE YELLOW SIGNED MARK IN EXC. A large Carlton Ware Buttercup Australian Plate. 4 carlton ware sunflower mugs, on with hairline crack as pictured.